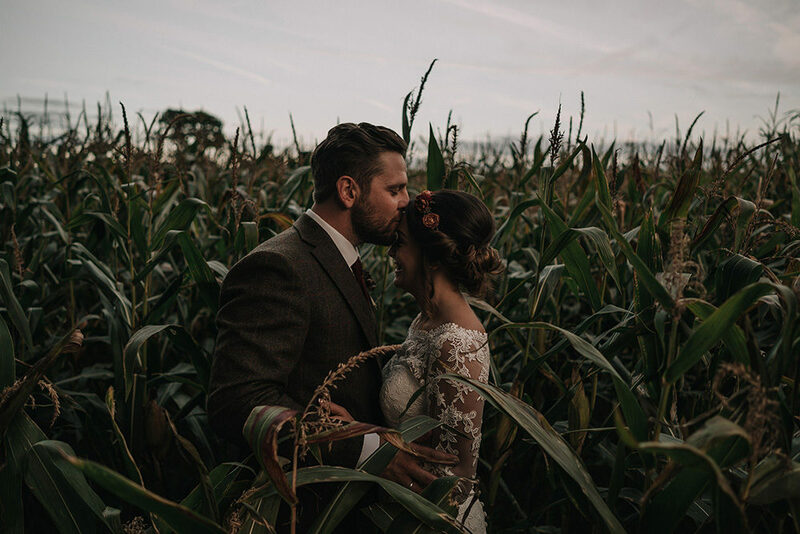 I can’t think of a better photographer than Jason Mark Harris to capture this gorgeous ‘Middle-earth’ wedding. 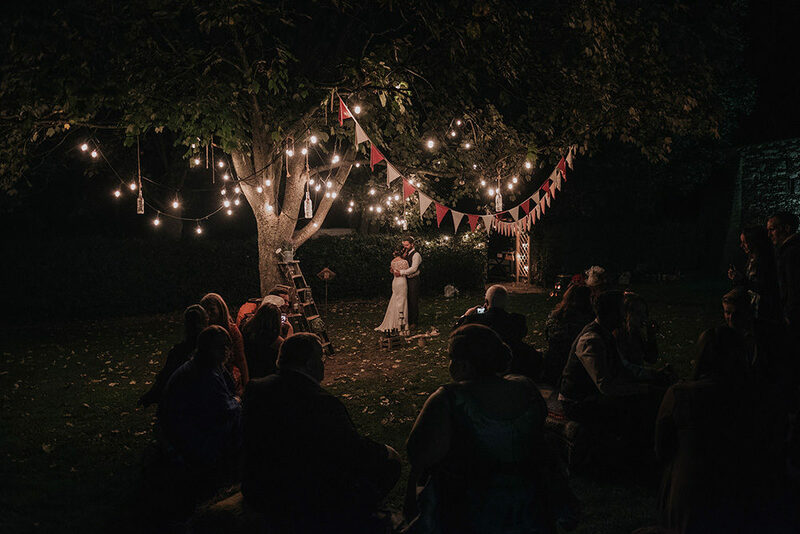 Everything is beautifully atmospheric and rich with a warm colour palette of reds and oranges, all lit up by ambient candle and festoon lights. Although it is a Lord of the Rings themed wedding, all the decor has been tastefully incorporated. 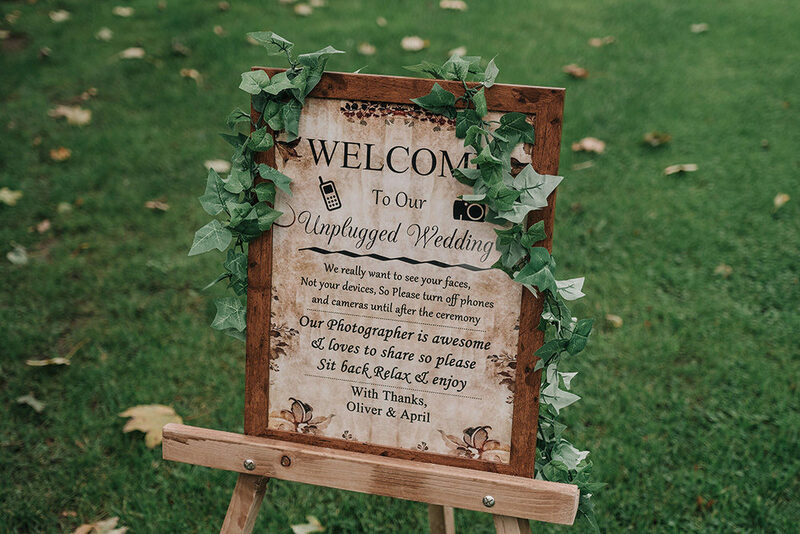 From the fabulous map wedding stationery, to the floral centrepieces, including a Shire Hobbit hole for the top table. Much of the decor was DIY’ed too making it all extra special. April the Bride: I always know I wanted to wear a floral headpiece so I had this made custom made by Garenofwhimsy with matching hairclips for my bridal party before I went dress shopping. I visited three shops all in one day and found my dream dress at Sophie Grace thanks to Mo. After trying loads of dresses I had picked out and no luck, Mo said try this one on and that was it. I fell in love with the lace detail and had bespoke alterations to make truly unique and fit me perfectly. My sister in law Polly and bridesmaid Laura luckily are hairdressers so both worked their magic on the bridal party. Our makeup was done by Dani who is an artist. I literally couldn’t believe how I looked, I am so happy I went for false lashes too. I was happy for my bridesmaids to choose their hair and makeup so they were comfortable with how they looked. They looked incedible! 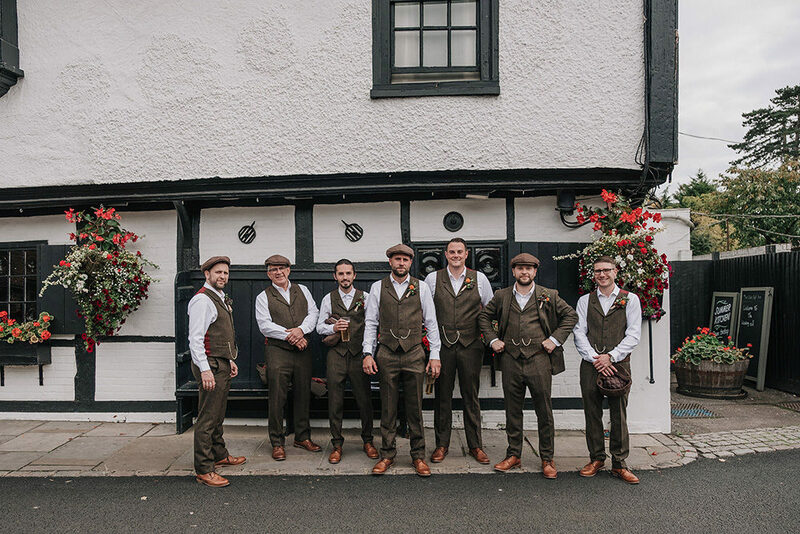 Olly had a version of how he wanted to look on the day, of course making reference where possible to the Lord of the Rings with green tweed suits and red and mustard ties similar to the hobbit waistcoat. Olly even had Bilbo Baggins acorn cufflinks as a finishing touch, which was a gift from his mum Sharon. Two days after our engagement I was searching for barns. When I walked into Monks Barn I knew it was the most perfect rustic middle earth setting. My only concern was, it was completely DIY! But I am so pleased that didn’t put us off as after two years of planning, making and collecting the barn looked incredible. 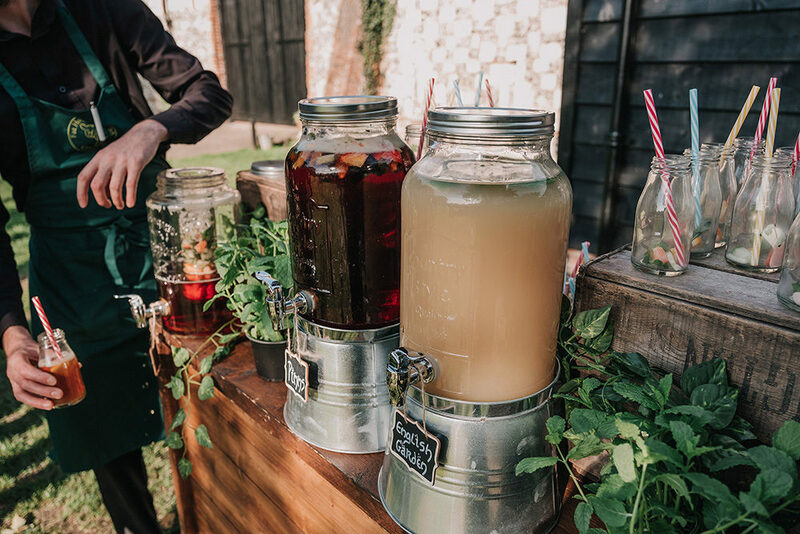 We hired rustic tables & barrels from Anthology Vintage Hire and had festoon lighting put up by Oakwood Events to create the feeling of a hobbit banquet. Autumn is our favourite time of the year so went for warm rich colours. I spent 2 years making and collecting props. I loved every second and having a theme like LOTR made it truly personalised to us. A friend of the family called Liz beautifully crafted our flowers; she has just retired after 25 years of running the village florist in Yateley. Our flowers were the highlight to our day. How Liz managed to tie in with my headpiece so perfectly just blew me away and seeing all the flowers in the barn added the finishing wow factor. I fell in love with my bridesmaid dresses on ASOS. It was a bit touch and go if we would manage to get them as they kept going out of stock. But with each of my bridesmaids continually checking we managed to get all four dresses. 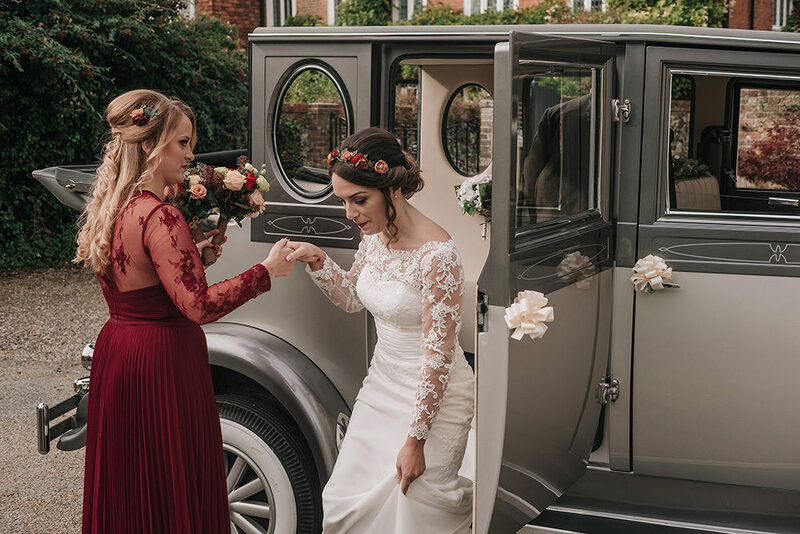 The colour was the main reason I chose the dark burgundy went perfectly with the colour theme and the long lace sleeves complimented my dress style. Hurley is a beauIful village with St Mary Church just across the road to Monks Barn this meant our guest just scrolled from one to the other. I walked down the aisle to breaking of the fellowship song in true LOTR style. London Trio played while our guests arrived in the barn garden. It was a beauIful day with the violins creating a relaxed atmosphere. We so nearly weren’t going to have any entertainment but it was worth every penny. 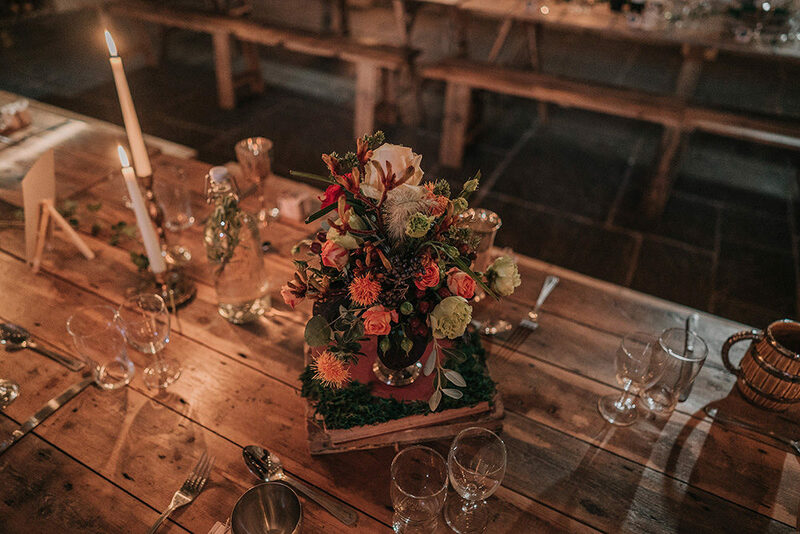 To go with the rustic feel we had canapé served on wooden boards then went for a wedding breakfast banquet that guest went up to help themselves. Dessert was served at the table in jam jars and in the evening we went for cheese boards. 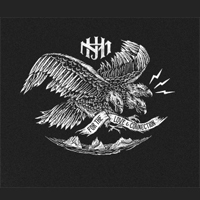 The service from The Fat Hog team was incredible. Olly designed our cake when we were discussing with our cake designer Nina I was surprised she understood his vision but when we got her first sketch emailed we know it was going to be an incredible cake. I booked Jason a week after we got engaged I just know he had to be our photographer. We both loved his atmospheric images and couldn’t wait to have him capture our day both on camera and film. I spent most weekends making something for the wedding. My advice to any bride is don’t under estimate how long things take to make. Olly kept saying to me we have plenty of time, but I would never of been able to make the things I did if I didn’t have two years prepping. 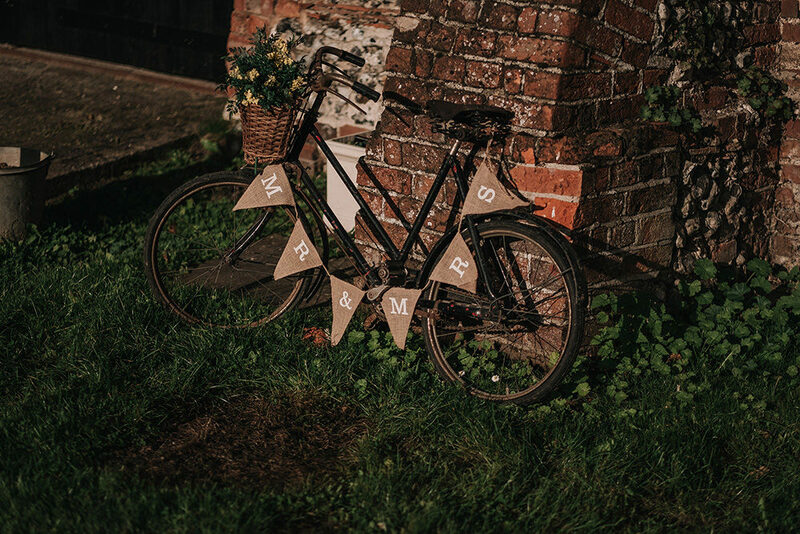 My favourite DIY project was making all the bunting for the barn and the wooden flower arch that was crafted by Olly’s brother to make a photo booth. Most things had a DIY touch which was another reason why we choose Monks Barns as we had access 3 days before to set up which we couldn’t of done without the help from our family and friends. Richard designed, with us, our wedding invites and table names. This was the first thing to set the tone of our wedding. The invitations made lots of reference to LOTR but personalised to our Fricker Fellowship. I loved the back of the invites that had a map of Hurley town but in the style of a LOTR map. We then made and put in a gold ring in each envelope and sealed with wax stamp of the tree of Gondor. Our guests loved them, some even went as far to wear the ring! I went for the Imperial from Christopher Cars for its vintage style. The journey through the countryside with my dad will be a journey I will never forget.